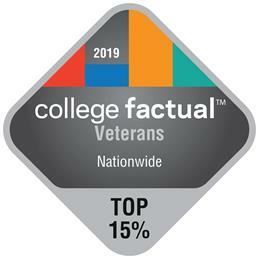 Baruch College has been ranked among the nation’s and New York State’s top schools in College Factual’s 2019 “Best Colleges for Veterans” list, which surveyed 1,820 schools for veteran friendliness. According to King, Baruch College is focused on accessibility for veterans and providing a supportive community to pursue their educational and career objectives. Currently, the College serves 156 veterans and military family members as of fall 2018. Baruch offers an active Student Veterans of America chapter, exclusive networking and career-readiness events for veterans and military family members, and dedicated staff who work to ensure the success of student veterans at Baruch. College Factual said, “Colleges and universities must demonstrate quality outcomes and support dedicated to veterans in order to achieve recognition” on this ranking. The quality factors included in that help veterans “identify colleges that are likely to be supportive of them and their unique needs” include veteran affordability, veteran resources available at an institution, veteran population, veteran policy, veteran satisfaction, and overall college quality. More information about the rankings methodology is available here.